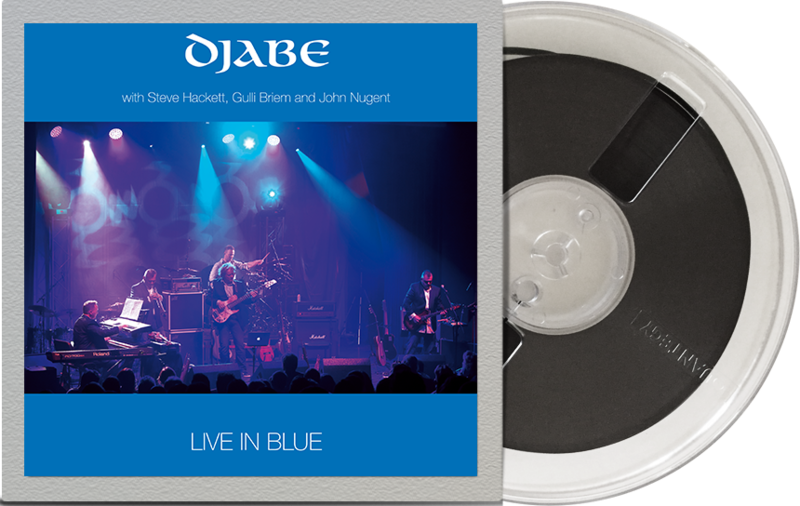 Djabe – Live In Blue LP available in 4-track reel-to-reel tape! The vinyl version of Live In Blue, recorded at the Djabe tours between 2012 and 2014, is confessedly became a testbed for High-End systems. This material now became available on master tape. The 4-track version is a 19cm/s recording speed high-quality tape, made for home hi-fi systems. Master tapes are made one-by-one at the band’s own recording studio, by their own sound engineers, on outstanding quailty material. The 4-track reel-to-reel tape is available for order in the Djabe webshop. At the premiere of the then-new album Down And Up Djabe began a grandiose tour spanning till 2014 with locations in Hungary, Europe and Canada. Gigs were often guest starred by musican friends of the band, hence the numerous guest stars on the release. Steve Hackett of Genesis playing the guitar, Gulli Briem of Mezzoforte manned the drums and percussion, and New York-based Canadian saxophonist John Nugent (Tony Bennett, Ella Fitzgerald) made the guest list complete. The gig at Miskolc, Hungary on November 10, 2013 was exceptionally unconventional, as the Hungarian Symphony Orchestra Miskolc and flute player Sára Kovács also took part in the program. The Live In Blue first release, the vinyl LP, gives a taste of all the line-ups from the gigs. The Djabe base line-up (Barabás, Banai, Égerházi, Ferenc Kovács, Zoltán Kovács) can also be heard, in the Los Sipos gig at Miskolc, Hungary, and in Life Spirit on 2014, Óbudai Festival. Djabe played with Steve Hackett on the recording of Ace of Wands, at Miskolc, Hungary. Jacuzzi and Overnight Sleeper were made here, with arrangement and conduction of the Symphonic Orchestra by Zoltán Kovács. Sára Kovács played the flute, Steve Hackett played the guitar. Djabe recorded the rest of the LP in 2013 at the PECSA Music Hall, where Gulli Briem and John Nugent guest starred. These pieces, with two long medleys, give a taste of the complete career of the Band, as they include compositions from every studio albums till the Take On. The first 2015 release of Djabe takes pieces from the most exciting gigs of the Down And Up tour. With this extraordinary release, Attila Égerházi and co once again raised the bar for quality. The Live In Blue LP is exceptional, content-wise, design-wise and quality-wise also. This 180g audiophile disc is a coloured vinyl of transparent blue. A limited edition, with a quantity of 500 of unique serial numbering. With a tasty, beautiful packaging. A joy to hold in your hands. Even compared to Djabe / Gramy prevous releases, the sound flowing from the speakers is outstanding. Clean, lively sounding with powerful, healthy dinamism. These might be clichés but even so, they are true. I would be pretty startled if Live In Blue wouldn’t join the test albums of hi-fi heads and audio salons of standards.